Is it a sign of old age when you buy a rocking chair? I went to an estate sale about a month ago and even though they had dozens of vintage quilt tops I ended up buying a rocking chair. It is hard to tell in the picture how bad the condition of the upholstery is. The springs in the seat are all sprung and it is very uncomfortable. I decided to recover it. Here is the seat once I got the old fabric off. My initial plan was to re-tie the springs and put it back together but once I got a closer look I saw that the wood was in terrible shape. 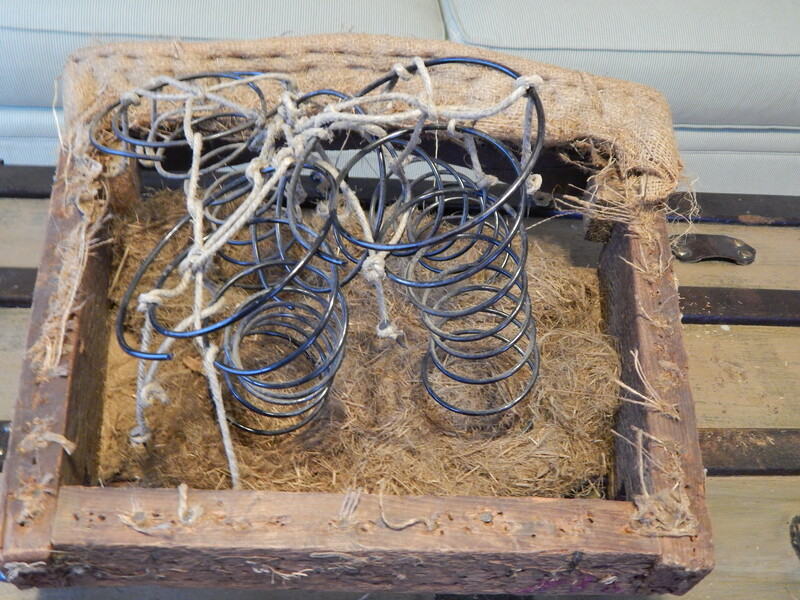 The reason the springs were popped is because the wood was so worn out it could not hold on to the nails. It had several cracks as well. It looks like it had been recovered at least a dozen time and all those tacks in an out over all those years just wore it out. 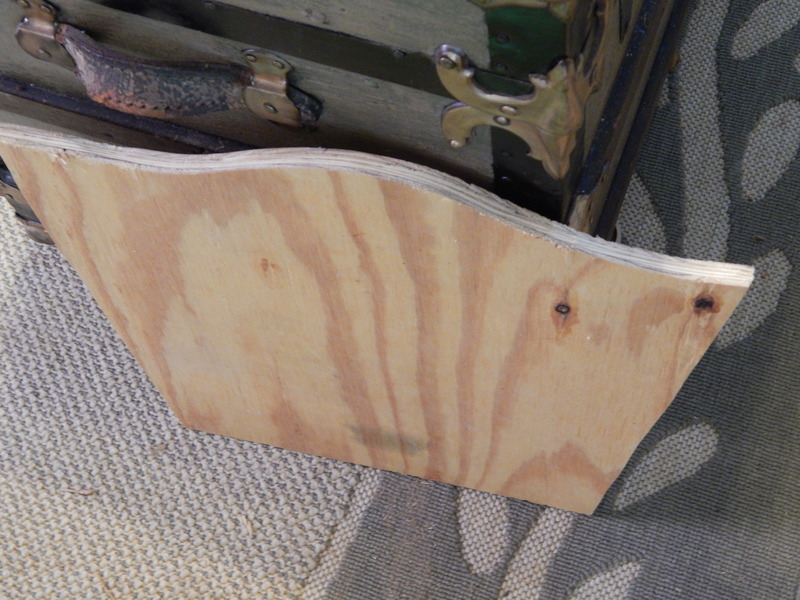 I decided to make a new seat with plywood. Perhaps not historically correct but it sure is easier than trying to rebuild the old one. I also ditched the springs and used a high density upholstery foam. The back was not bad so I was able to recover it as it was. 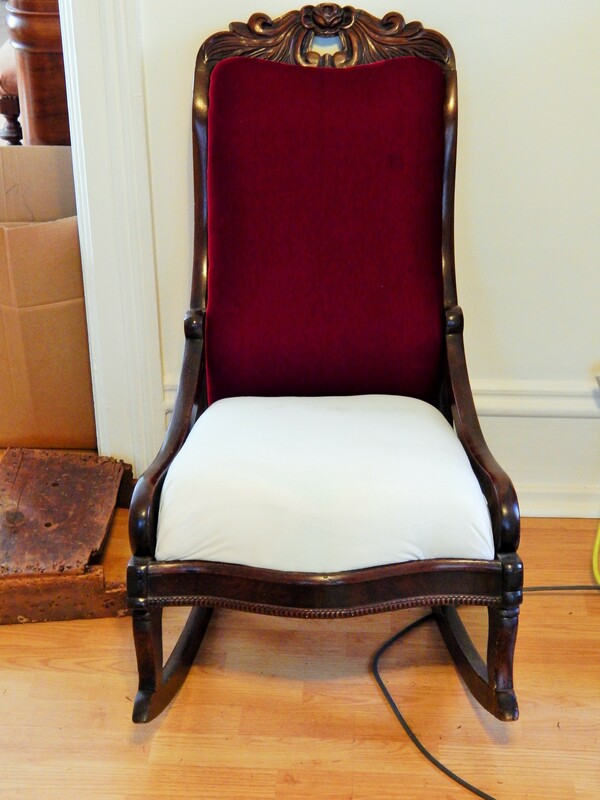 The seat got covered with muslin first so I could get the shape right before I cut into the velvet. I think Teddy wanted to try sitting on it. After a little more adjustment of the seat I was ready for the velvet. I have no Idea what this might have originally been covered with but I like the way it looks with now. 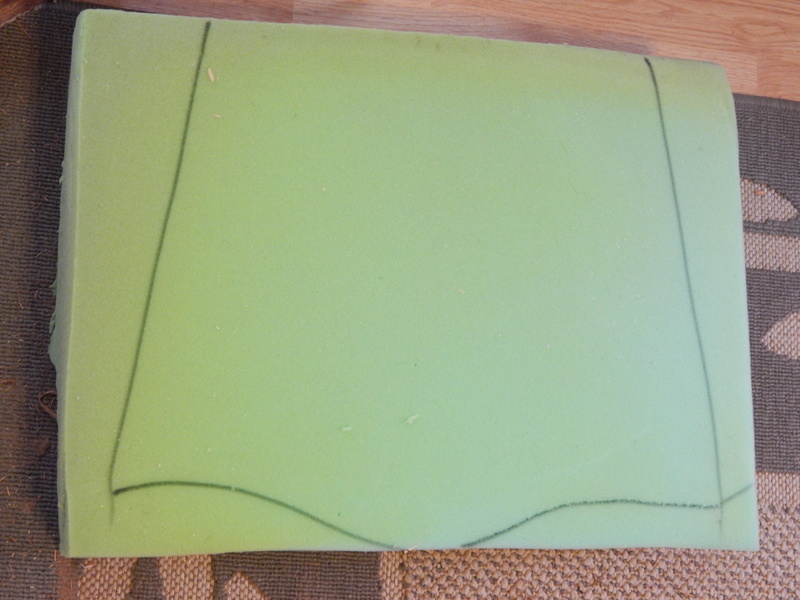 The electric carving knife is the best tool for cutting upholstery foam. Now back to work on a few quilts. This entry was posted in ETC and tagged rocking chair, upholstery. I thought you might cover in patchwork for the new studio. I have been looking for just the right chair to cover in patchwork for my sewing room. 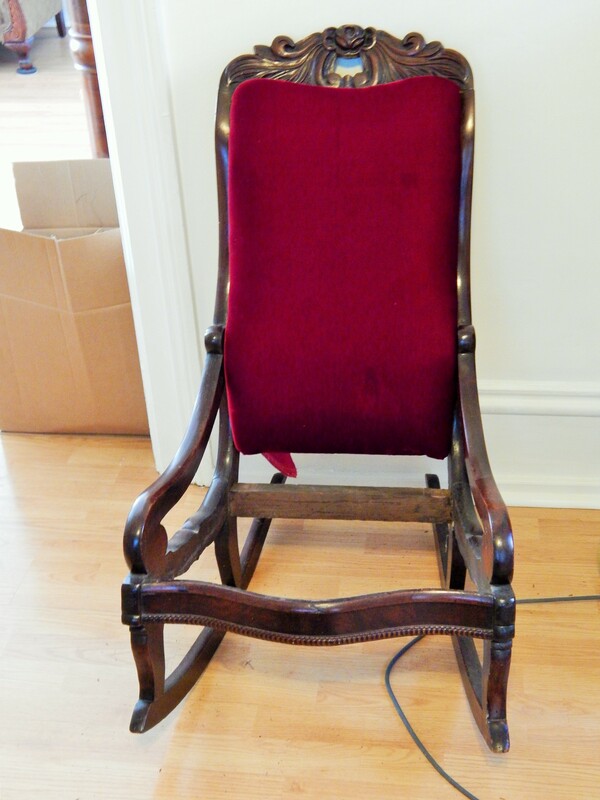 I do have another chair that I plan to do in patchwork…..
Wow! 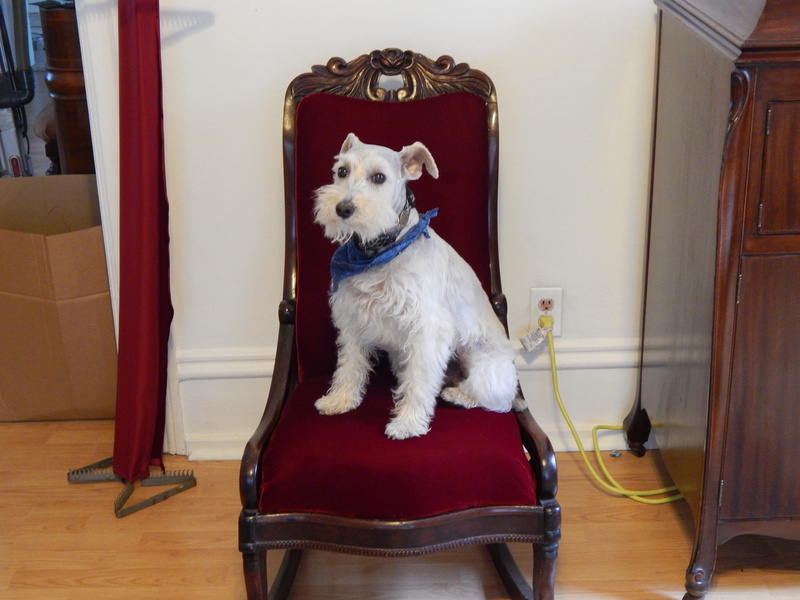 That is a chair fit for a king – King Teddy that is. I love it. You are so hihly skilled in so many areas! The chair is gorgeous! It’s a beautiful one too! You did a marvelous job. Teddy looks so regal sitting on it. Great throne for Teddy pup. Love your posts. Thanks…he likes it….but forgets that it moves…..
Wow, a jack of all trades! And Teddy looks like a little prince on that velvet! I think he has claimed it as his own! I think a rocking chair is so soothing. Enjoy! Lovely chair. Beautiful upholstery job! 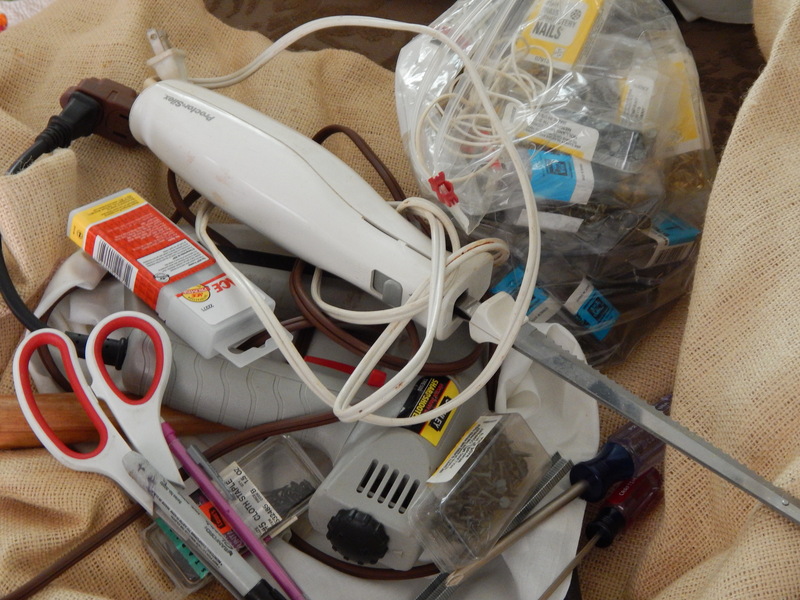 My folks had an electric carving knife like that one. I saw it at the cabin…perhaps I need it in case I want to cut some foam in the future! The chair looks great! 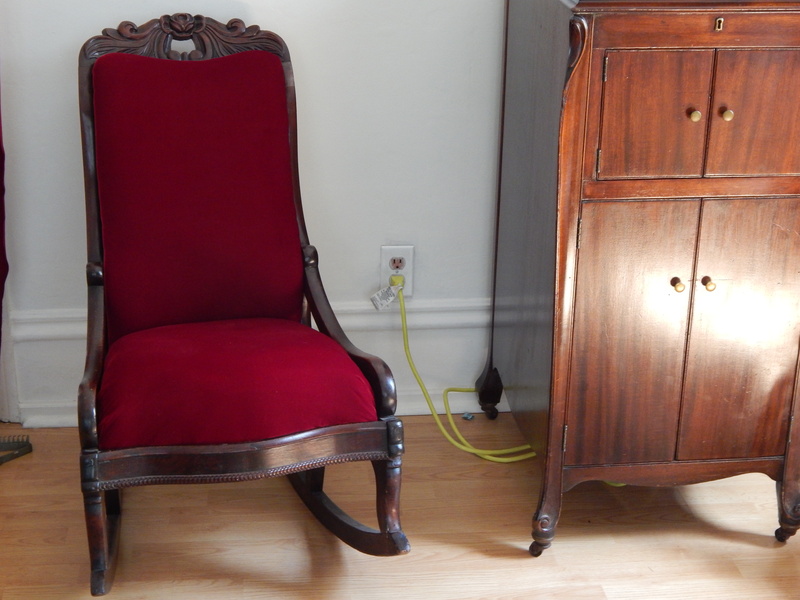 My Great Uncle has an old rocker covered in wine red velvet that has been in the family for a long time. So your color is a good one. I know it was red velvet in the very early 50’s and I do not know how long before that. You need to use the rocker and Teddy with a red velvet scarf for your Christmas cards! 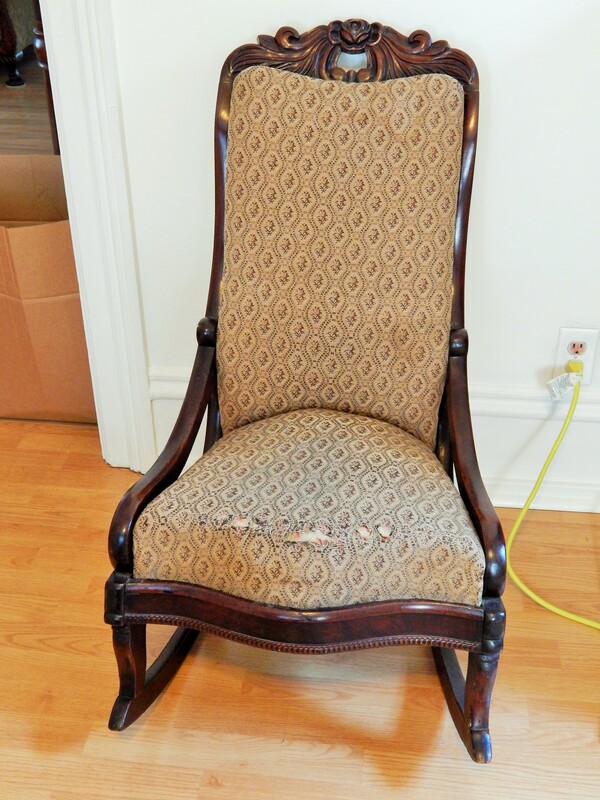 Great job on the chair, are you going to start holding upholstery classes now? Oh my gosh! Your talents know no bounds! 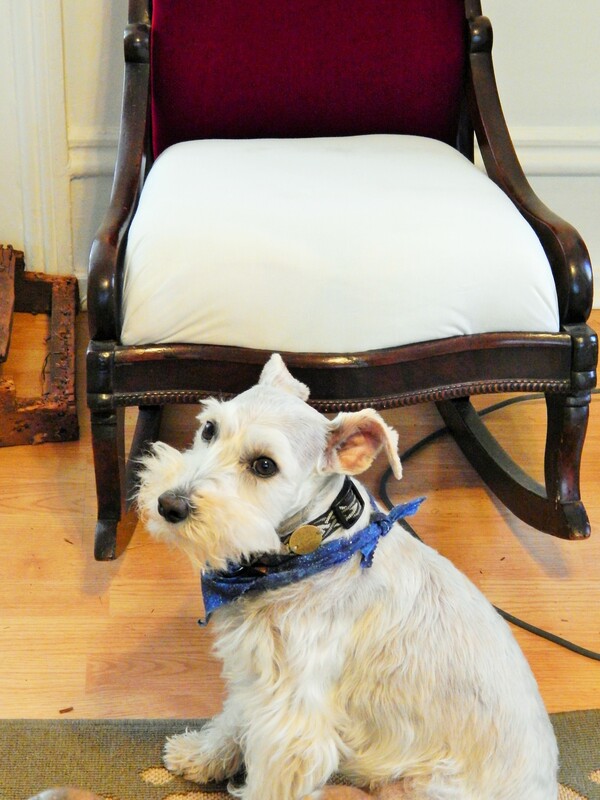 Teddy looks especially valiant in the rocker. Has he claimed it as his own? What an adorable picture. You did a fantastic job on the chair. I have a grafanola just like that.. Absolutely love the old 78s. Love the chair too. To paraphrase Homer Simpson; Tim Latimer. Is there anything he can’t do? Ahh, you are wise as well, Tim-san. Tim and Teddy, you both are a pair of characters. You should do a show. The first episode could be Tim and Teddy: The Rocking Chair. Your rocking chair is gorgeous! 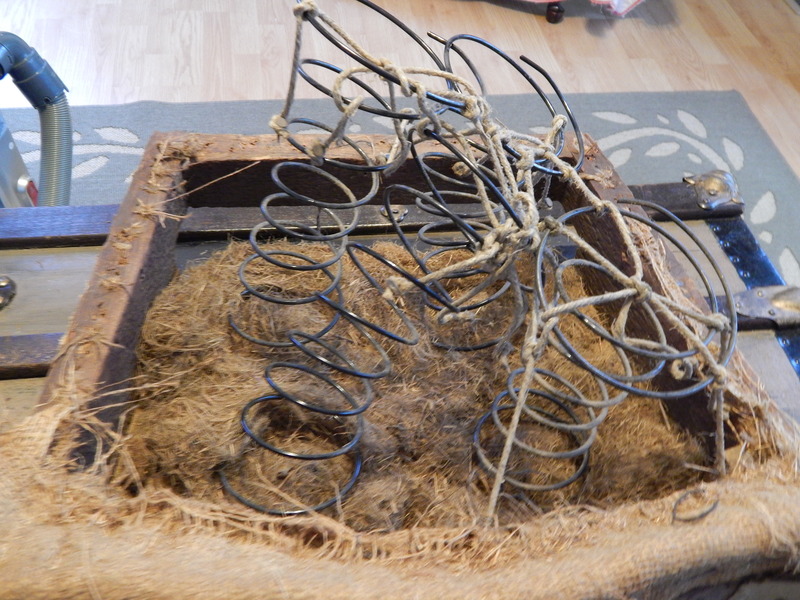 Don’t throw the springs away, they are great to use to make pincushions out of. No Tim, it is not. I have a rocker bought when I was 24. It’s a porch rocker that has almost always been inside. When my back bothers me it’s the answer. I’ve had it 38 years. That’s my favorite color. I have reupholestried lots of chairs. Sometimes the wood and the springs are so worn there’s no recovery for them. You’ve done a beautiful job. Looks like the frame was well cared for. I think Teddy likes it too. It is a beautiful piece of furniture. You did a fantastic job; the rocker really looks lovely. I am always amazed at your ingenuity! I am surprised you chose to use velvet though. Real velvet doesn’t wear, well does it? Wouldn’t repeated sitting in the same spot (which is unavoidable) crush the nap down? Will the lower height be comfortable for you (a taller person) to sit in? And the low arms on your antique rocker mark it as a “nursing rocker” that moms would sit in while feeding their babies, or some call them sewing rockers too! 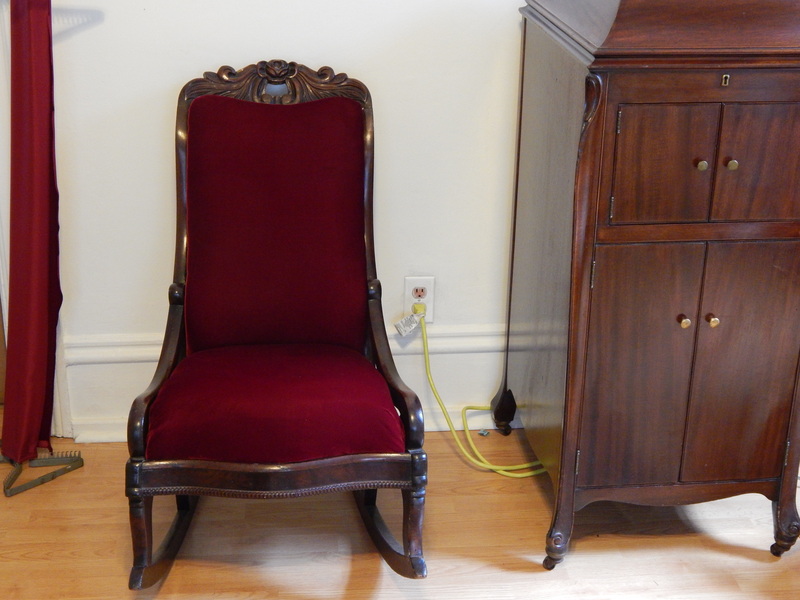 A really lovely piece of furniture–what a great find!! in the closet, and the chairs waiting for me to reupholster, and a loveseat. And what had me stopped was not knowing how to cut the foam I need to get. Who knew I need to order an electric knife also! I am so glad you rescued that rocker. My Grandpa always sit in a rocker and at home we did, too. I’m 65 and can’t imagine going without a rocker. Such a pretty color you put on it. I can see that Teddy is happy there, or at least for now. Enjoy your blog! Talk about multi talented! Your chair looks wonderful Tim.